Just two weeks after Burlington, I let Tessa talk me into riding 100 km in the Rochester Tour de Cure, my first-ever long-distance bicycle ride. So it was back on the bicycle, which served the dual purpose of keeping my aerobic fitness up while easing the wear-and-tear on my lower body. Before the Boilermaker: Representing Team Love Nugget. July 13, 2014. Did I say, “easing the wear-and-tear on my body?” By that, what I really meant was: finding a new and different way to beat it up. To be sure, the hills around Mendon and Honeoye Falls provided a testing, but not brutal, workout, despite my uncanny ability to select exactly the wrong gear for every elevation we encountered. But trying to negotiate the clip pedals on my borrowed road bike led to some pretty hard dismounts and several chunks of flesh being removed from my left shin. Even so, as a Type II diabetic, it was worth a little bloodshed (and the occasional funny looks from my fellow cyclists) to don the Red Rider jersey and raise awareness and a few bucks for the American Diabetes Association. Next up was the annual ritual of the Boilermaker. Thankfully, this year the weather took mercy on us, and conditions at gun time were more comfortable than last year. As I had done previously, I ran the course in thirds: cautiously, and avoiding the traffic, from the start to the top of the golf course hill, hard down the hill to the 10K split, and harder down Champlain Avenue to the finish. But even though I ran a similar race to the ones I had run before, I didn’t want my familiarity with the race to breed contempt for it. I was there to defend a PB streak that was going into its fifth year. More, I wanted to break 80 minutes for the first time. Eighty minutes, as it turned out, was too much to ask this time around. With the Mountain Goat injury still fresh in my mind, I went out too cautious on the first third and paid for it in the end. Still, it was a good day at the office, and the beers at the end ended up being beers of celebration. Not only did I shave 5:30 off my PB for a net time of 81:25, my biggest PB gain in the race for three years, but I was able to claim bragging rights over several friends for the first time in five attempts. More important, it was the breakthrough I had been waiting for. In the weeks following, for the first time in many months, I found myself enjoying running again. From the beginning of April until after the Mountain Goat at the beginning of May, every run had been painful. Worse, the thought of reinjuring my calf and the failure in Burlington had got into my head. All of those factors made my decision to go back to the Hanson’s beginner training program pretty easy. I tweaked it just a little in the months that followed to accommodate running the Rochester Half and to add in a little more mileage (three more 16+ mile long runs than the program calls for, including a 20-miler three weeks out). Otherwise, I stuck with it religiously, cheating only once at the end of August when family commitments were too much for me to tackle a weekend long run. I also freshened things up by changing my evening interval and tempo routes, though that was more out of necessity than design. As Niagara Falls was at the end of October, I found myself struggling to fit in a 12-mile run on Tuesday evenings as summer melted into fall and the evening light began to fade. Rather than drive the 45 minutes to home from work, change and head out, I wore my running clothes under my work clothes and headed out to Onondaga Lake Park, which is just 10-15 minutes from my office building in downtown Syracuse. The changes helped incredibly. My enthusiasm for running was renewed, and it showed. Times for my Tuesday and Thursday runs were fast. Better still, I felt strong and my legs were pain free. A good showing at the Rochester Half, where I missed a PB by just 22 seconds after running the last two miles in a downpour of Biblical proportions, only served to make me hungry for my last competitive run of the year. It was time to sing my redemption song. To the 3,062nd go the spoils. 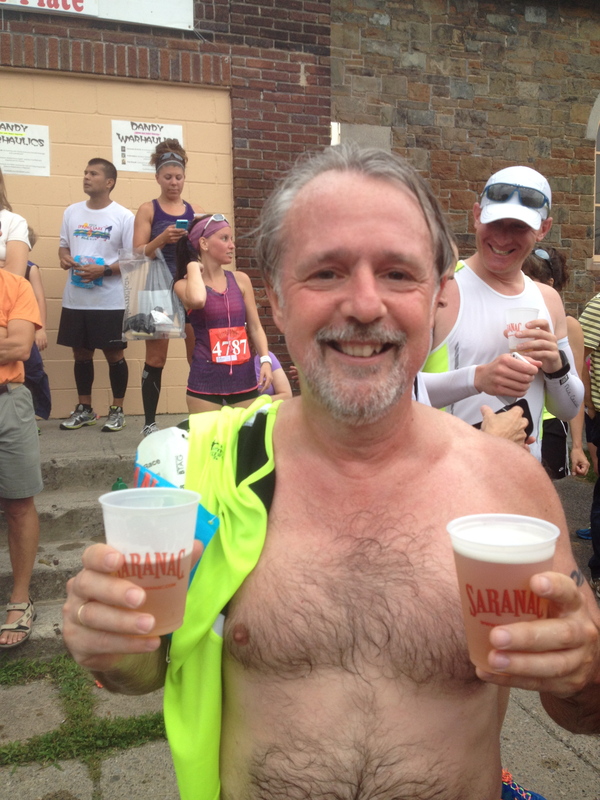 After the Boilermaker. July 13, 2014. 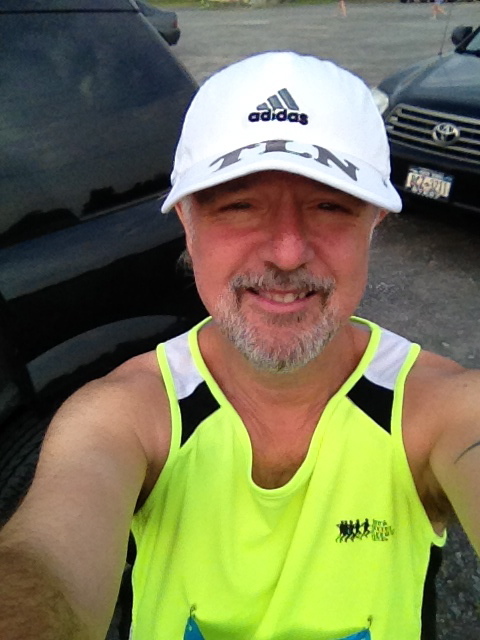 This entry was posted in The Flat-Footed Fox and tagged Boilermaker, half marathon, Hanson's Marathon Training, long-distance running, Niagara Falls International Marathon, Rochester Half Marathon, Rochester Tour de Cure, Vermont City Marathon (Burlington). Bookmark the permalink.